It’s surprising how a small piece of technology changed the face of personal computing. From the first commercial microprocessor (4-bit 4004) which was developed by Intel in 1971 to the more advanced and versatile 64-bit Itanium 2, the microprocessor technology has shifted to a whole new realm of next-generation architectures. The advancements in microprocessor technology have made personal computing faster and reliable than ever before. If microprocessor is the heart of the computer system, microcontroller is the brains. Both microprocessor and microcontroller are often used in synonymous with each other because of the fact that they share common features and they are specifically designed for real time applications. However, they have their fair share of differences too. Microprocessor is a silicon-based integrated chip with only a central processing unit. It’s the heart of a computer system which is designed to perform loads of tasks that involve data. 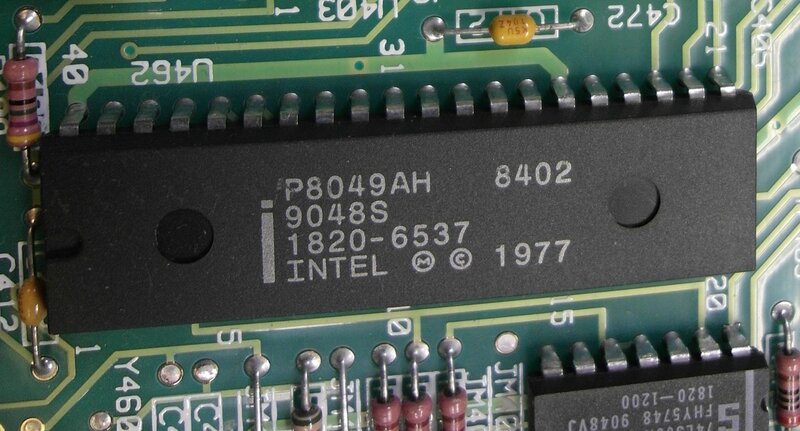 Microprocessors don’t have RAM, ROM, IO pins, Timers, and other peripherals on the chip. They are to be added externally to make them functional. It consists of the ALU which handles all the arithmetic and logical operations; the Control Unit which manages and handles the flow of instructions throughout the system; and Register Array which stores the data from memory for fast access. They are designed for general purpose applications such as logical operations in computer system. In simple terms, it’s a fully-functional CPU on a single integrated circuit that is used by a computer system to do its work. Microcontroller is like a mini computer with a CPU along with RAM, ROM, serial ports, timers, and IO peripherals all embedded on a single chip. It’s designed to perform application specific tasks that require a certain degree of control such as a TV remote, LED display panel, smart watches, vehicles, traffic light control, temperature control, etc. It’s a high-end device with a microprocessor, memory, and input/output ports all on a single chip. It’s the brains of a computer system which contains enough circuitry to perform specific functions without external memory. Since it lacks external components, the power consumption is less which makes it ideal for devices running on batteries. Simple speaking, a microcontroller is complete computer system with less external hardware. 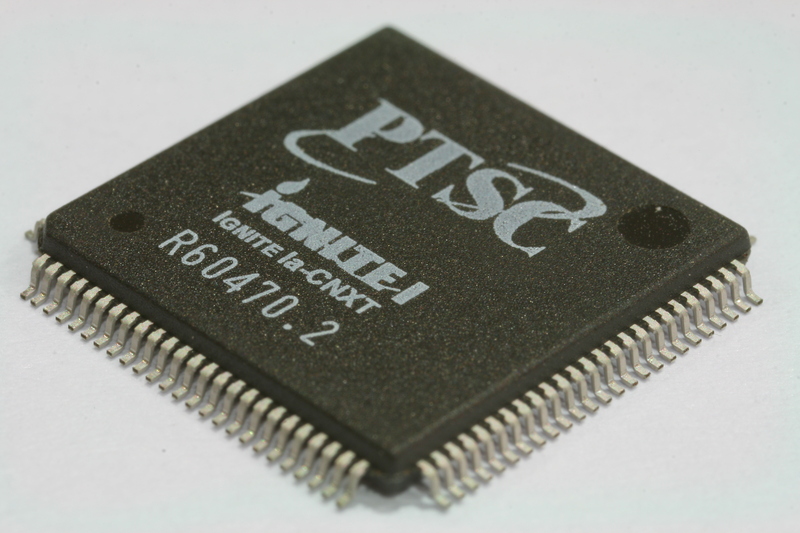 Microprocessor is a programmable multi-purpose silicon chip which is the most critical component within a computer system. It’s like a heart of the computer system which consists of ALU (Arithmetic Logic Unit), Control Unit, instruction decoders, and Register Array. Microcontroller, on the other hand, is the heart of the embedded system which is a byproduct of the microprocessor technology. Microprocessor is just an integrated circuit with no RAM, ROM, or input/output pins. It basically refers to the central processing unit of the computer system which fetches, interprets and executes commands passed to it. It incorporates the functions of a CPU into a single integrated circuit. Microcontrollers, on the other hand, are more powerful devices which contain the circuitry of microprocessor and have RAM, IO, and processor all in a single chip. Microprocessor requires an external bus to interface to peripherals such as RAM, ROM, Analog and Digital IO, and serial ports. The ALU performs all the arithmetic and logical operations coming from the memory or input devices and executes the results onto the output devices. Microcontroller is a small device with all peripherals embedded on a single chip and it’s designed to perform specific tasks such as executing programs for controlling other devices. Data memory is a part of the PIC which contains Special Function Registers and General Purpose Registers. It stores data temporarily and keeps intermediate results. Microprocessors execute several instructions that are stored in the memory and send the results to the output. Microcontrollers contain one or more CPUs along with RAM and other peripherals. The CPU fetches the instructions from the memory and executes the results. Microprocessors are based on von Neumann architecture (also known as the von Neumann model and Princeton architecture) in which the control unit fetches the instructions by assigning control signals to the hardware and decodes them. The idea is to store instructions in memory along with the data on which the instructions operate. Microcontrollers, on the other hand, are based on the Harvard architecture where instructions and program data are stored separately. Microprocessors are a mass storage device with a single chip and are embedded in several applications such as spec control, traffic light control, temperature control, test instruments, real-time monitoring system, and much more. Microcontrollers are mainly used in electrical and electronics circuits and automatically controlled devices such as high-end medical instruments, automotive engine control systems, solar chargers, games machine, traffic light control, industrial control devices, etc. The key difference between both the terms is the presence of peripheral. Unlike microcontrollers, microprocessors have no built-in memory, ROM, serial ports, Timers, and other peripherals that constitute a system. An external bus is required to interface to peripherals. A microcontroller, on the other hand, has all the peripherals such as processor, RAM, ROM, and IO all integrated in a single chip. It has an internal controlling bus which is not available to the designer. As all the components are packed in one chip, it’s compact which makes it ideal for large-scale industrial applications. Microprocessor is the heart of the computer system and a microcontroller is the brains. Sagar Khillar. 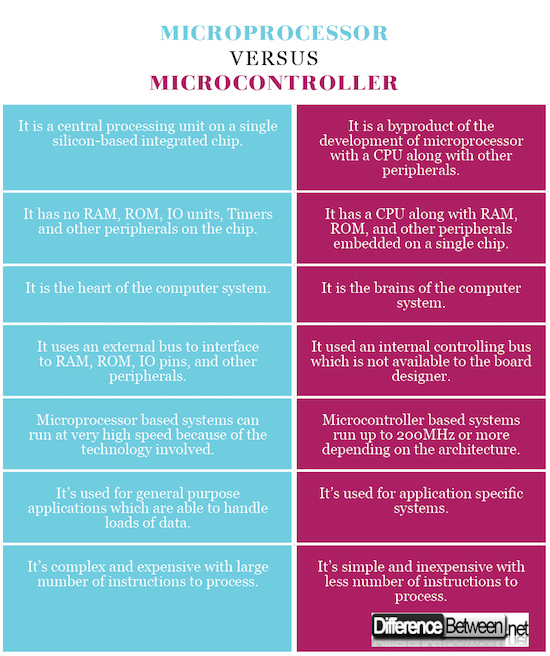 "Difference between Microprocessor and Microcontroller." DifferenceBetween.net. April 12, 2018 < http://www.differencebetween.net/technology/difference-between-microprocessor-and-microcontroller/ >.